While runners complete their respective training programs, leading up to the Fitbit Miami Marathon and Half Marathon on Jan. 27, we spoke with participants about what inspires them to run. Ron Siemens running a 10K in November. Ron Siemens began running in 2012, after the Fort Lauderdale resident hosted some friends who participated that year in the half marathon in Miami. “I told them that if I was going to get up that early again to cheer them on, I might as well run with them,” he recalled. So, he vowed to sign up for the 2013 half marathon and began training year-round to prepare. While his friends stood him up in 2013, albeit with good excuses, Mr. Siemens completed his first half marathon that year in Miami, followed by another half marathon in Fort Lauderdale. “I was hooked,” he said. Since his first race, he has participated in 21 half marathons and five full marathons, including races in New York, Colorado and Chicago. Most recently, he completed a half marathon in Weston in early December. This month, he’ll run his sixth full marathon in the Fitbit Miami Marathon and Half Marathon and hopes to beat his personal record of 4:06, which he achieved in October at the Bank of America Chicago Marathon. 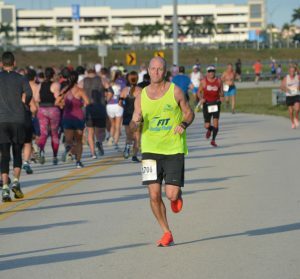 To train for each race, starting with the New York Marathon in 2016, Mr. Siemens joined Friends In Training (FIT) in Fort Lauderdale and looks forward to his training runs on Saturday mornings, despite the early wake-up call to get in his miles before the South Florida sun begins to bake the runners. “A big motivation for me is to see all the success of my friends and fellow runners,” he said of his FIT teammates. In fact, last year, when a hip injury while training for the Miami marathon sidelined him from the full marathon and subsequent training, he found motivation from his teammates to push through and get healthy again. Through hard work, sheer determination and self-care to understand his body’s abilities and limitations, Mr. Siemens fought through the frustration of having to slow down and rebuild his strength and endurance. “During any race, there’s a struggle,” he said. “A gut check tells you to fight through the pain and keep going.” That philosophy brought him back from injury with big plans for 2019. In addition to the Miami marathon, Mr. Siemens plans to run the Fort Lauderdale A1A Half Marathon in February, the Little Rock marathon in March, and the Star Wars Rival Run at Disney World and the Derby Marathon in Louisville, Kentucky, both in April. Augusto Nuñez has three adult daughters and six grandchildren. The semi-retired co-owner of J & A Tenting Fumigation in Westchester began running in 5Ks and 10Ks 30 years ago. He ran his first half marathon with his youngest daughter seven years ago, followed the next time with all three of his daughters. Since then, he has run six half marathons. 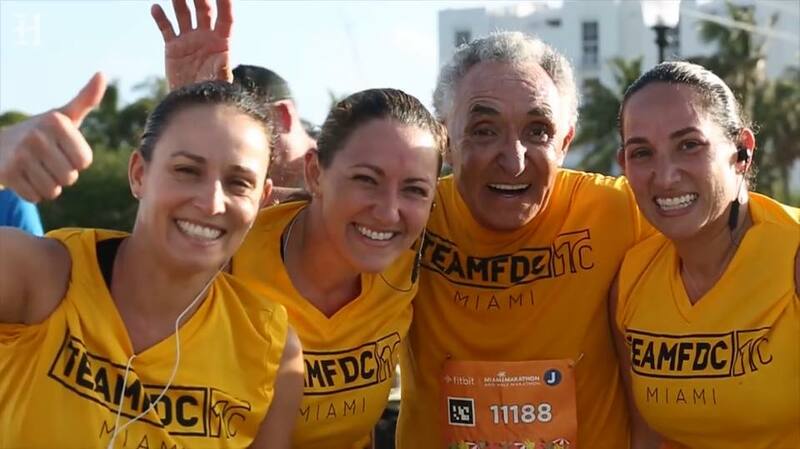 Augusto Nuñez, with daughters Jasmine Ferro, Caryn Nuñez and Natalie Nuñez Valdes, after completing the 2018 half marathon in Miami. “I feel good when I exercise,” he said, adding that he goes to the gym six days a week. “I am at the gym at 5:15 a.m. and take the 5:45 a.m. spinning class two or three times each week.” When he’s not spinning, he’s lifting weights and working on his core muscles. Nuñez surrounded by his wife, daughters and grandkids. 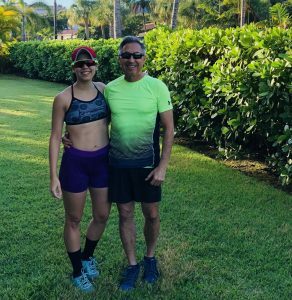 Since September, Mr. Nuñez has also been running every Saturday with his daughters and Team FDC Miami, preparing to run another half marathon together in the Fitbit Miami Marathon and Half Marathon on Jan. 27. Asked whether he and his daughters will compete against each other for the best time, he said the four of them will keep pace with each other. “We just want to finish,” he said. He also said this family of runners has begun pruning a third generation. Two of Mr. Nuñez’s grandchildren ran 3.1 miles in the Baptist Health Turkey Trot Miami 5K/10K on Thanksgiving. “I’m pushing them,” he said. 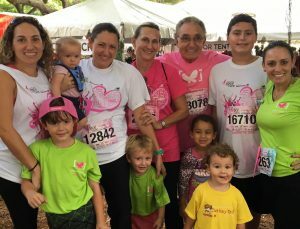 Those grandkids, along with his other grandchildren, and his wife of 45 years, Lilian, will be cheering him on at the finish line, as he completes his seventh half marathon. Luis Tovar, 33, a telecommunications engineer from Venezuela who’s been in South Florida for three years, said he started running regularly in the summer of 2017. 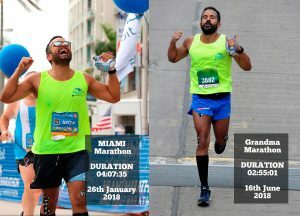 He ran last year’s Miami marathon, the full course, and finished at four hours and seven minutes, a very respectable time for a first-time marathoner. But Mr. Tovar is a competitor and he is his toughest critic. He then set a new goal: qualify for the Boston Marathon. But for that to happen, he would need to finish a full marathon in less than 3 hours, “which seemed impossible because my first full marathon was 4:07,” he adds. Nonetheless, the stress on his body has not stopped his momentum and competitive spirit. Daniela Vicentini has been active her entire life. The Coconut Grove resident says she has played soccer, basketball, tennis and golf, and has participated in competitive swimming for as long as she can remember. In addition, she had enjoyed running, especially with her dad, Andres, and had run 5Ks in the past. Daniela Vicentini and her dad Andres, 61. While working as a chef and a marketing consultant for the food industry, Ms. Vicentini felt overwhelmed and longed to add physical activity back into her daily schedule. “I felt exhausted all the time and didn’t have time to work out,” she said. She wanted to make a fresh start. After leaving the rigors of being a chef and gaining some much-needed “me” time, she joined the Baptist Health South Florida Brickell Run Club, a group she had run with before. She began running with them again last April, and in a short time, she had improved her time to under an 8-minute mile – an accomplishment that sparked her competitive nature and her desire to keep running faster. “I was beating men in my group,” she said. Even though she wanted to sign up for a full marathon, she decided to pace herself and register, instead, for the 13-mile half marathon distance of the Fitbit Miami Marathon and Half Marathon. Yet, her hunger to do her best in the event prompted her to seek a more rigorous training regimen, which she found with 101 Training, a triathlon-training organization on Key Biscayne. Now, in addition to her Tuesday-night runs with the Brickell Run Club, she trains daily at 5:30 a.m., incorporating cycling and running into her training. Her goal is to complete the half marathon in under two hours. She also plans to compete in her first triathlon in 2019 and has her sights set on completing a full marathon in 2020. “I feel empowered!” she said.